THE PICKIEST EATER IN THE WORLD: OLE! 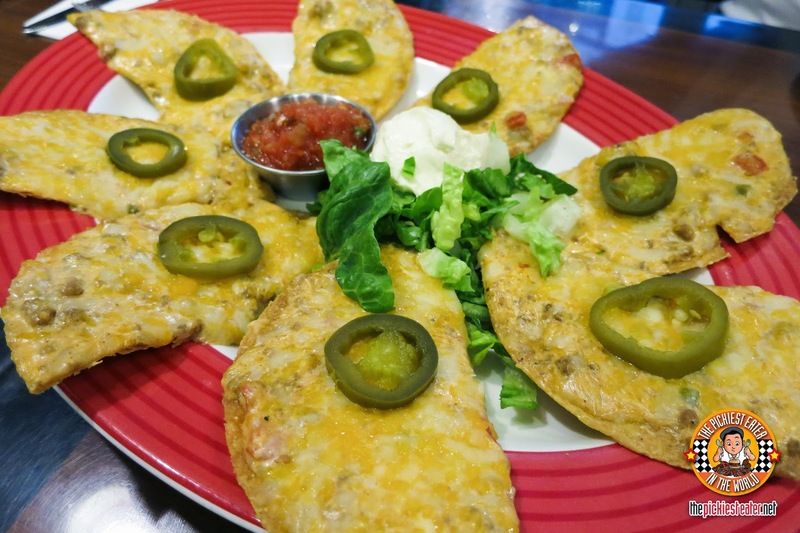 IT'S TGI FRIDAY'S TEX-MEX MENU! 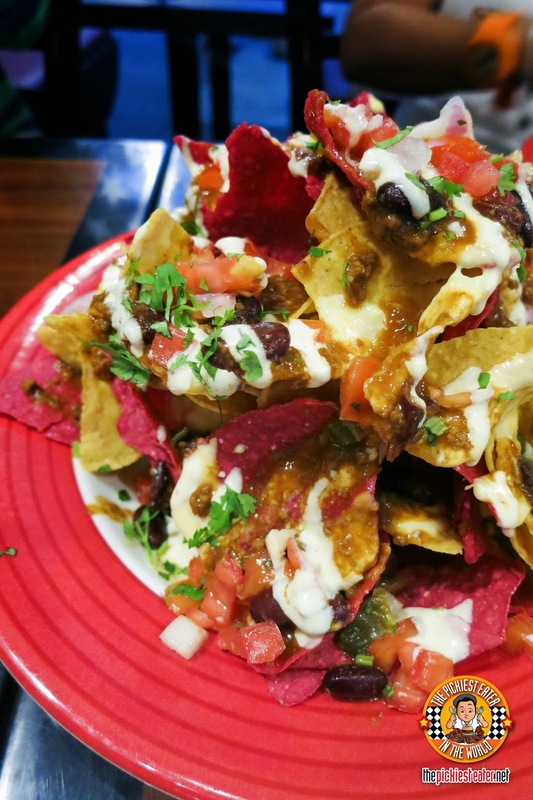 Starting with the Friday's Chili Ball Park Nachos (P375 solo / P545 sharing). A mountain of colored nachos covered in generous drizzles of cheese, salsa, sour cream, and chilli. Just imagine the party of flavors in your mouth brought about by this very festive looking appetizer! You see, the thing I like most about nachos is the cheese. That's why I like getting the ones on top because they have the most cheese. And then the problem comes when you're eating it with another person who likes cheese as much as you do. 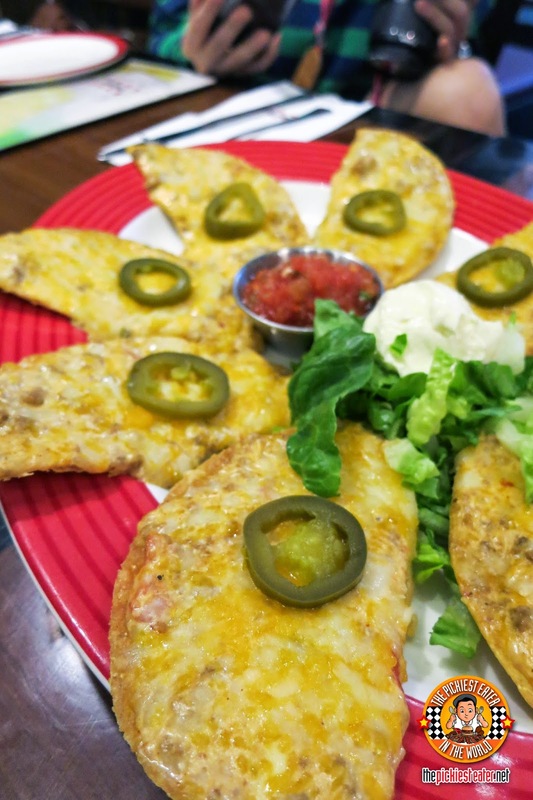 But that's the beauty of the Tostada Nachos (P495) because each crispy tortilla has melted gooey cheese! Cheese is equally divided among all the tortillas! Cheese lover problems solved! Crispy and gooey. Just perfect! And it goes even perfectly with the salsa and sour cream that comes with it! 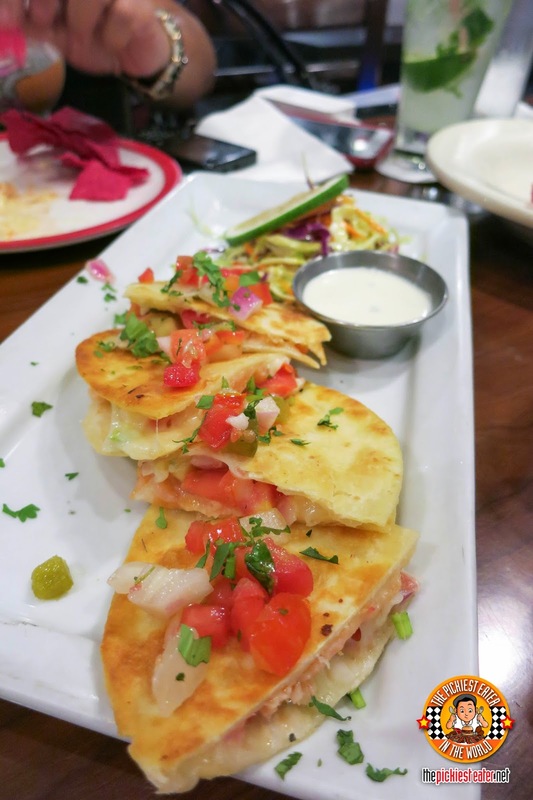 TGI Fridays broke the norm for quesadillas when they made this Smoked Salmon Quesadilla (P345). Honestly, I'm not sure if it has been done by others but it's pretty new to me and more importantly, it bodes well for me because I'm a sucker for SMOKED salmon. (Notice the emphasis on the word smoked. I wouldn't have salmon any other way). See, I love salty that's why I love smoked salmon. 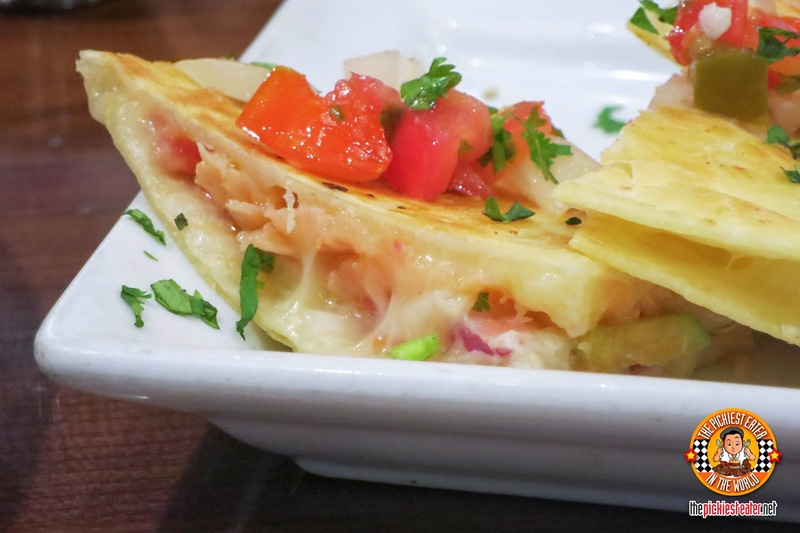 The tex mex flavors with the smoked salmon surprisingly works. For me anyway. Look at that generous serving of cheese and smoked salmon! The BBQ Pork Tacos (P475), from what I recall, was also one of Richie's favorites that night. It comes to no surprise though.. Pork tenderloin in sweet barbecue sauce, laying on a bed of soft tortillas, with cheese, crispy onions, cilantro, and tomatoes. Served with fries. It sounds like it was made specifically for Richie! But sometimes, we can't go through life without rice. And by "we", I mean me. 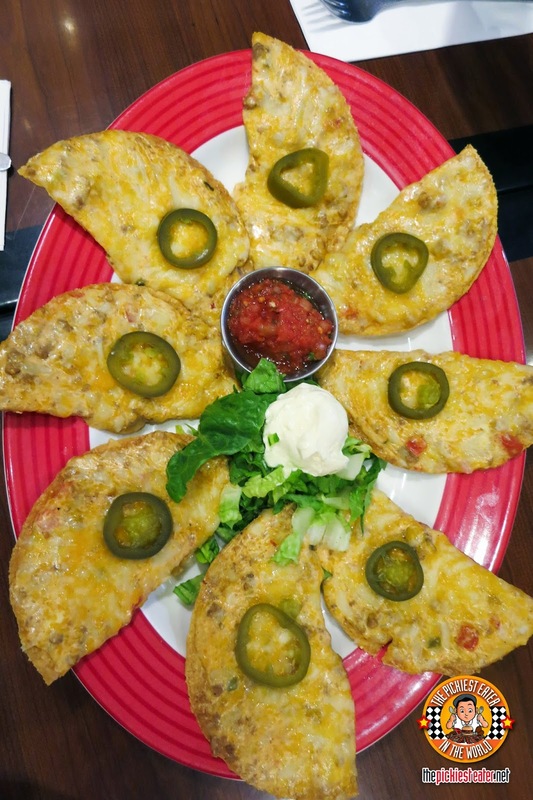 But TGIFriday's Tex Mex menu has got that covered (Thanks guys!). 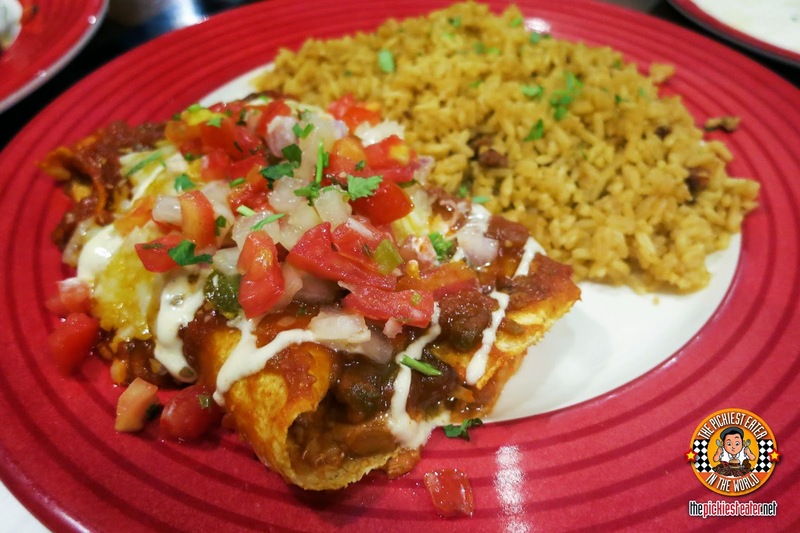 The Ranchero Chicken Enchilada (P495) is served with chorizo rice! Yum! As you can imagine, this is a very heavy meal because the two rolls of chicken enchiladas alone are quite filling already. Plus, would you look at that yummy cheese blanketing the enchiladas? And that about wraps it up! 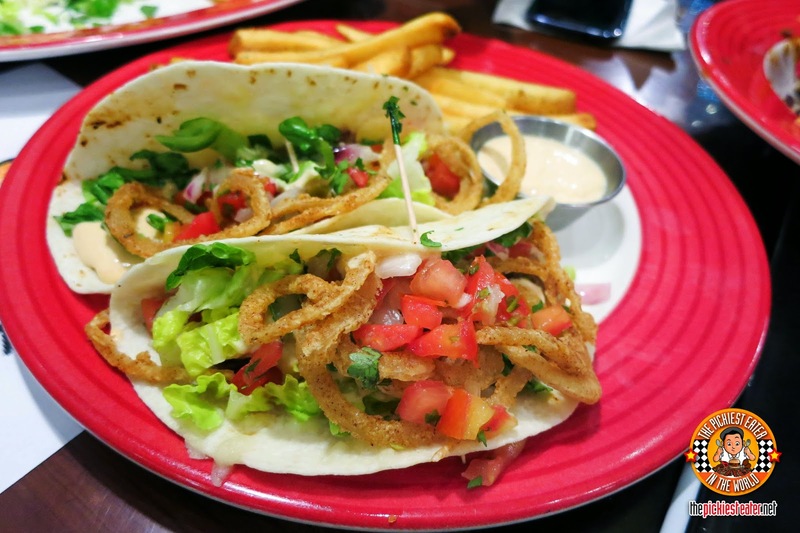 If you feel like having a Tex Mex feast, remember that TGIFriday's would be one of your yummy options from now on! Ole!! !